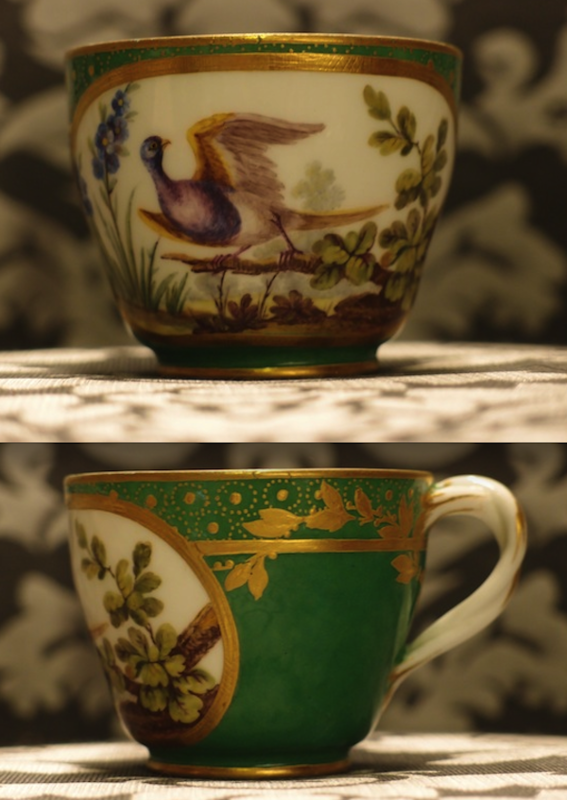 (SOLD)Cup (only, no saucer) Sevres, 1772, painted by the renowned bird painter painter, Francois-Joseph Aloncle, active C1758 - 1780. Aloncle was a painter in Paris before joining Sèvres in May 1758. He became one of the factory’s principal bird painters. One week before his death he married Françoise-Feliticité Bulidon, daughter of the Sèvres sculptor Henri Bulidon. A similar Aloncle cup is nr C.1415-1919 in the Victoria and Albert Museum. (SOLD)Cup (only, no saucer) Sevres, 1772, painted by the renowned bird painter painter, Francois-Joseph Aloncle, active C1758 – 1780.